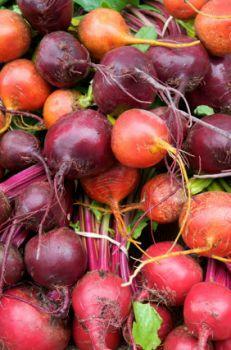 Beets are in season during summer, fall, and winter, so "How do you cook raw beets?" becomes a pertinent question for anyone who's itching to prepare meals that include seasonal produce. Beets have a rich, earthy flavor and a beautiful color, and they make a stand-out addition to a variety of salads and main dishes. They're also packed with vitamins and minerals. Because their raw texture is so tough and their pigment is so strong, they tend to intimidate some home cooks, but it's not difficult to work with them. Beets are more versatile than you might think. If you want to cook and serve whole beets, try to choose beets that are similar in size so they cook in the same amount of time. Their leaves should look strong and colorful, and the beets themselves should be firm. Chop off the beet greens, and save them for later. They can be cooked just like spinach, collards, kale, or other hearty greens. Leave about 1 inch of stem at the top of each beet. Rinse the beets thoroughly and wipe them dry. Boiling is one way to prevent beets from bleeding too much color when you cut into them. Use a large pot of water so that beets have enough room to bounce around, cook evenly, and stay covered. If you want to preserve the deepest color in the beets, add a small spoonful of vinegar to the boiling water. Place the beets in the pot, cover it, and boil the vegetables for about 45 minutes or until they are tender and cooked through. 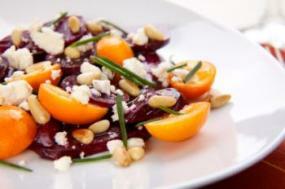 Raw and near-raw beets can be enjoyed in a simple salad for a refreshing taste and texture. To blanch beets, immerse them in boiling water for up to 5 minutes, and plunge them into a bowl of cold or ice water immediately afterward. When the beets have cooled, peel them with a vegetable peeler and grate them for use in your salad or another dish. Steamed beets are moist, with a concentrated flavor and a pleasant, crisp-tender texture. Place a steamer or colander in a large stockpot filled with a few inches of simmering water. Put the clean beets in the steamer or colander, and let them steam for about 40 minutes. When a knife or fork can pierce them all the way through, they're ready to be used. Prepare sauteed or pan-fried beets as you would potatoes or carrots. Chop the beets into cubes or thin slices. Warm a heavy skillet over medium-high heat, and pour in some cooking oil or butter. When the oil or butter is hot, add the chopped beets. Sauté, stirring occasionally with a wooden spoon, until they are tender. Depending on the heat of your burner, the process could take 8 to 20 minutes. Roasting beets leaves them with a great texture and is an ideal preparation technique for many recipes. Preheat your oven to 400 degrees Fahrenheit, and chop beets or leave them whole. If you do chop them, bear in mind that they'll take less time to roast and will burn more easily. Place them on a baking sheet covered with foil, and wrap the foil around the beets to keep them moist. Put the sheet in the oven, and roast the beets for about 45 minutes or until they are tender. With the aid of a microwave, the question "How do you cook raw beets?" becomes almost irrelevant. It's simple to clean a few beets and just pop them in the microwave until they're ready to go. Prepare the beets as you would for boiling, and place them in a single layer in a heat-proof dish. Cover the beets, and microwave them on HIGH for 10 to 25 minutes, depending on how many beets you are cooking. Stop the beets every 3 to 5 minutes to turn them and pierce them to check their progress. When they are tender, they're done. With so many ways to cook raw beets, you can easily incorporate them into your recipes and your menus. Try a few of the methods mentioned here and decide which one delivers the best flavor for your tastes.